The compressors on the Edvard Grieg oil platform, some 160 km off the Norwegian coast, as manufactured by Siemens in Hengelo, have been fitted with ‘state of the art’ noise enclosures. The enclosures were designed and manufactured by Merford Noise Control, a Dutch company which specialises in sound insulation. It was a mega-operation which took a year to complete. For the Edvard Grieg oil platform, Siemens in the Netherlands was commissioned by Aker Solutions in Norway to develop the compressor skids on the platform. Siemens then appealed to Merford Noise Control to develop and build high quality noise enclosures for the compressors. All parties worked intensively together to deliver this huge and complex project on time. And they were successful. Recently the oil platform went into operation. The new platform was required to comply in all respects with NORSOK, strict standards developed by the Norwegian petroleum industry. Because of the noise involved in pushing gas through the pipelines, NORSOK stipulates that all compressor trains must be fitted with noise reduction enclosures that need to be considered as working environment. The noise enclosures needed to be effective in three areas. Firstly, they had to reduce noise. Pressing gas through the pipelines is a very noisy process, with many high tones. This noise can rise to sound pressure levels of approx. 95 dB(A). The Merford enclosures easily reduce this to well below the required level. The enclosures must also be explosion-proof. Stef Zoeteman from Merford: “If there were to be an explosion on the platform, further escalations need to be prevented. The noise enclosures are designed in such a way that no parts can fly off which – as a result of the explosion – could lead to new explosions or calamities on other parts of the platform.” Siemens and Merford therefore completely recalculated the initial design and challenged the blast specifications. Resulting in an optimized and weight saving blast philosophy whereby the enclosures can deform plastically where allowed and deform elastically where critical parts are fitted on the compressor skid. Shipping to Norway took place in the spring of 2014. The completely assembled enclosures were shipped on specially designed transport frames. 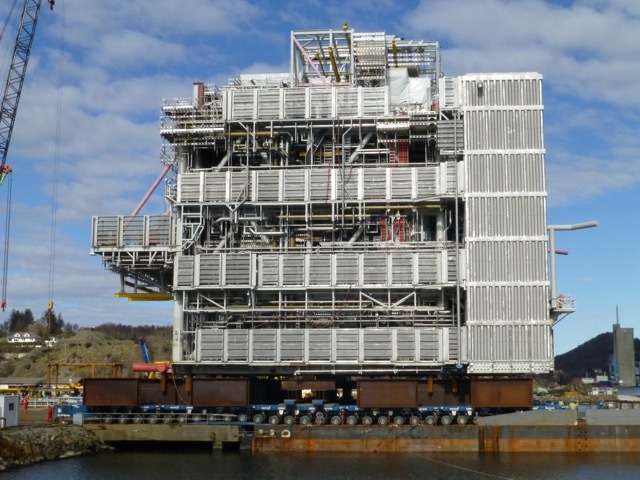 On arrival in Norway, the huge structures – the biggest enclosure is 16.8 m long, 5 m wide, 5.6 m high and weighs 34.2 t – were lifted in one go over the compressor skids onto the platform, leaving only millimetres on all sides. This was a massive and risky operation, but was nevertheless completed in less than an hour. November last year the platform started operation, and successfully. For Siemens and Merford, the production and delivery of the compressor skids and the noise enclosures were an exciting process. “Together, we didn’t deliver a standard solution, but a real state of the art engineering product. We should be proud”, says Zoeteman.